A $750 security deposit authorization is required with this reservation and we will process a credit card authorization in that amount 7 days prior to your arrival. A charge may result for damage to the condo or contents, missing pool smart key(s), missing contents, excessive cleaning required after checkout, fine(s) levied by the association for rules violation(s), insufficient barbeque grill cleaning or exceeding the maximum number of overnight guests. 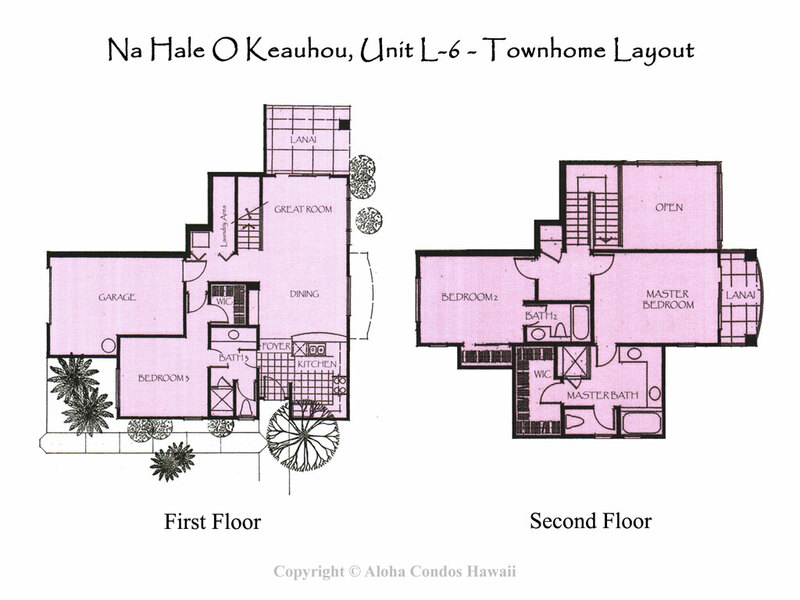 Na Hale O Keauhou is a condominium association and as such enforces House Rules to maintain a very high standard that helps makes this such a desirable place to live and visit. Owners and vacation rental guests are required to follow these rules and are subject to fines for violation of the rules. We allow a maximum of 6 overnight guests. With more than 4 guests, a $15 fee per additional guest is charged per day. Falsely representing less guests than are actually staying will result in loss of all deposits and immediate eviction. The initial reservation deposit is nonrefundable; however if cancellation is made more than 60 days prior to the check-in date, the full initial reservation deposit may be applied to a new set of reservation dates in the same condo beginning anytime up to one year from the original check-in date (subject to availability). Check-in time is 3 PM and check-out time is 11 AM. Please be certain to plan your arrival and departures times accordingly. An early check-in time or a late check-out time may be available and is subject to a fee. Please contact Kris for more details. Central air conditioning is available at a rate of $15.00 per day. Air conditioning is required from June 1st through October 31st and is optional for all other dates. IMPORTANT KEYCARD POLICY FOR LOST OR STOLEN KEYCARDS: The Na Hale O Keauhou Condominium Association has implemented a keycard access for the pool effective April 15, 2017. You will be provided two keycards for pool access. In the event that one or both keycards are lost, stolen or inadvertently packed, the association will charge a $250.00 replacement fee for each card. If one or both keycards are missing, replacement card(s) will be made for the next arriving guest. The missing card(s) will be deleted from the system so finding and returning a lost card will not entitle you to a refund. Our Property Manager will check the unit to ensure both keycards are present at time of move-in and move-out. THIS IS A NON-SMOKING UNIT. Smoking or vaping is strictly prohibited in the condo, in the garage or on the condo lanai and doing so will result in full loss of security deposit & immediate eviction. The association rules prohibit any smoking on the premises if the unit is designated non-smoking. There is a bench provided outside the Na Hale O Keauhou gate for smoking. The Association prohibits business use stays on the property (i.e. work crews, business vehicles, work trucks etc.) This unit is for VACATION USE ONLY and violation of this policy will result in full loss of security deposit and immediate eviction. No vehicle parking in the garage. Garage for personal item storage only. This is the third year in a row that we have stayed at Na Hale O Keauhou, and L-6 has been the best townhouse so far! We like the 3 bedroom, 3 bath model with one of the bedrooms downstairs as that provides privacy, especially if there are two families. We enjoyed the beach equipment, especially the chairs, towels and boogie boards! The kitchen is well-equipped and the barbecue grill is a plus. After traveling to the Big Island for several years, Na Hale O Keauhou has been a great find because of its location, its amenities and all of the comforts of home! Kris and her property manager were very accomodating and great to work with, and we will be back at L-6 next year! Welcome to Aloha!! Listen to the crashing surf from gorgeous Na Hale O Keauhou L-6. Spacious 2-story luxury air-conditioned Townhome with Panoramic Ocean Views. This wonderful recently remodeled and upgraded unit features 3 Bedrooms, 3 Baths, well-appointed kitchen and front-load washer/dryer. Enjoy the Weber Barbeque Grill on your private lanai! Upgrades abound...new air conditioning system with higher cooling capacity, quiet luxury ceiling fans in each room, tile flooring through out, high speed internet and HD TV with expanded digital channel lineup. Master suite with roomy bathroom and private lanai. Second bedroom with private bath on second floor. One bedroom and one bathroom with walk-in shower is located on the main floor. Garage is available for personal item storage only. We provide beach chairs, matts, cooler, umbrella for your convenience. Na Hale O Keauhou Resort Is a gated community and features large pool area with hot tub and air conditioned exercise room. Walking distance to snorkeling beach, shopping, grocery store, restaurants and movie theatre. For golf enthusiasts, recently reopened Kona Country Club is less than a five minute drive. Longer stays (more than 21 days) may be eligible for reduced rate. Please contact property manager for info. Please review the Unit Policies regarding strict prohibition on smoking and business use of the condo. We couldn't have been happier with our stay. While we have rented homes in the same development in the past, this was by far our favorite. It was obvious that the owners put thought into everything they included in the rental, and we didn't have to purchase anything that we wanted. Having a BBQ to use was one of the best features, and we ended up using it a few different nights for dinner. The furnishings were all extremely comfortable, with the master bed being one of, if not the most comfortable beds I've ever had in a rental. Finally, the view from the patio was unbeatable. We started every morning there with our coffee, and ended every night watching the beautiful sunsets without any buildings or other homes blocking our view of the ocean. Worth every penny! We can't wait to rent this unit again! Kristin, thank you so much for your kind review. Thank you for making us aware of the knives and need for extra food storage containers. I will address those items promptly! Mahalo and please come stay with us again! I returned with my family after visiting here a couple years ago. The owners of this condo did not furnish this condo nearly as well. I found the bedding and linens sparse and shabby. There was no tv in the master bedroom and the washing machine was broken. With a broken machine and few towels provided it dud not feel convenient or luxe. The condo sleeps 5 but we were forced to pay an up charge for our third child and upcharged for AC— in August In Hawaii. I may return there but I’d look more carefully at the unit I rented. The location was wonderful. Also the condo was not ready until 3 pm so even though our flight arrived at 11am we were forced to drive around with luggage in our car all day. No bueno. They should have offered to let us at least unload the car. On our tenth trip to the Big Island, this location and amenities were exceptional. Extremely clean and well stocked. The beds were great and having three bathrooms really went over well for our family group of five. Lots of extras and great kitchen with many useful appliances.Easy access to shops, restaurants, snorkeling and any other Big Island attractions. The sunsets were wonderful from the lanai, and sunrises from the master bedroom lanai. Safe location and secure access.Two minor issues were handled immediately with excellent communication. We are already planning a return trip. Loved the welcome fruit basket! That made it feel as if we were expected guests. The condo is very spacious, clean and well kept. The grounds are also well tended to as well. Every day we saw people gardening, trimming trees and spraying around for bugs. The kitchen is stocked with well thought out amenities. We appreciated the rice cooker, toaster and best of all the coffee maker. Nothing like a hot brew of 100% Kona coffee every morning while in Kona!! Great closet space and best of all - thank you for providing lots and lots of hangars. Believe it or not, my husband did miss having a television in the master bedroom, but really...who watches TV while on vacation. We were happy to have access to the garage space as we are a family of golfers and it was a nice place to safely store our golf clubs. L-6 is a great condo and one I would recommend to family and friends. Na Hale O is our favorite place to stay in Kona, and L6 is as well. It is very well furnished, very clean and comfortable. The complex is very quiet and beautifully maintained.Thank you once again Kris, for sharing your beautiful condo. We hope to be back next year. Great condo in a fantastic location, with good views of the ocean and easy walking to various restaurants and grocery. Spacious condo with comfortable beds and lots of closet space in all 3 bedrooms. Kitchen was well-equipped and provided beach items (chairs, umbrellas, towels, etc) were really helpful. Also nice to have garage area accessible for drying out stuff and storing the bikes we rented. Grounds are well kept and pool and fitness area are very nice.Will definitely stay here again and would highly recommend it for others! This condo is absolutely the most well equipped condo in which I have stayed. My family and I spent three weeks there and not once did we say "I wish this condo had a _____!" Every need was anticipated and thought of. It was a wonderful and restful time. There is not one thing I would change about this place. It is perfect in every way. The fitness room and pool area were wonderful. I felt safe there with the gated entrance. The beds were comfortable with great linens. The lanai off the main bedroom was just an added plus. In spite of all the bedrooms being used, there was a great sense of privacy as the sound proofing is fantastic. Once the bedroom doors were closed, we heard nothing. The location is especially nice, being able to walk to the shopping center for bakery items in the morning or to have dinner at any of the restaurants in the area. We rented L6 for 10 days over our March spring break 2016. This place is super clean and had everything we needed from beach chairs and umbrellas to kitchen tools and plates. The unit is situated at the front edge of the complex so the lower lanai had a perfect western view of the water and sunsets. We did not use the downstairs bedroom as our kids shared one of the upper bedrooms and we stayed in the spacious master suite (with an enormous bathroom). The downstairs bedroom would have been perfect for an older family member that did not want to navigate stairs. Overall, we had a wonderful stay and would rent this unit again if we get the chance. I spent a lot of time shopping and browsing to get the perfect rental for my family and I finally choose Na Hale O Keauhou for it's location, the pool, and the price. I made a really good choice. The place is really quiet. Most of the time all that you will ear is the birds and the ocean. The community is really clean, the pool and the Jacuzzi are warm and nice. This unit is really nice and comfortable. The kitchen is well stocked with olive oil, balsamic vinegar and a lot of spices. I was really impressed. They have a good choice of beach goods that you can use (beach chair, sand toys, boogieboard) It's nice not to have to pay for it and leave it behind. Everything was spotless clean when we arrived.Also, the owner of the condo is easy to join. We got no issue during our stay but when I had questions before our stay Kris was always availbale to give me answer shortly.Don't do like me and spend hours to book your reservation. What you get here will make your vacations perfect ! Having rented both houses and condos up and down the Kona Coast during the past 10 years, we found L-6 at Na Hale O Keauhou as the best, bar none, overall. The 3 bedroom unit is exceedingly spacious, exceptionally clean and was perfect for our group of 5. The location is ideal, being a very short drive or pleasant walk to fine snorkeling at Keauhou Bay and situated seconds from the modern Keauhou Shopping Center with its outstanding farmers market, Kona Stories Bookstore and IGa supermarket. Not to mention Sam Choy's restaurant just above the complex. There are a lot of units for rent at Na Hale O Keauhou but we were happy that we choose L-6 as it has uninterrupted vies of the ocean and landscaping, a number of other units look over roads or parking lots. The pool is also a minutes walk away up a small hill. Everything a family could need is provided in this new unit: We took the boogie boards and towels out everyday and grilled several nights on the lanai. The beds were exceptionally comfortable and bathrooms hotel-like. Everything here works. We will absolutely be back. We stayed during 'Spring Break' just after Easter yet the value was still amazing, frankly, the owners should charge more. The only concern during our entire week-long stay was the rather fastidious and particular older neighbor who reminded us frequently to strictly abide by the condo rules: no towels on lanai, no noise before 8am, etc. As long as you don't plan on any wild parties or late nights, you'll be fine. We will certainly be back, hopefully many times. The booking process was efficient and painless, after providing our credit card information on a secure server were emailed all the required information including codes to the front gate and to the lockbox containing the key. The property is located in a gated community on the hillside overlooking Kona with easy access to the main highway, and provides great views of the ocean from the lanai. The grounds are quiet, well kept, and include a pool and fitness centre. The unit itself is a spacious 3 bedroom/3bathroom town home of recent construction that has been very well maintained, and has a fully functional modern kitchen. We appreciated the guestbook which provided detailed information on the unit as well local shopping and restaurants. Useful items such as beach towels and chairs were also available. We have rented several houses over the last few years in different hawaiian islands and this has been the best experience so far. 14 members of my extended family decided to spend Christmas week on the big island of Hawaii. We booked 3 condos in the complex, with 5 of us (including me) in this unit. We booked through Vrbo which I found through Tripadvisor (my most favorite travel website). It was very easy to book, and the management was wonderful to work with from the beginning, through completing the booking, arriving in Hawaii and following up afterwards. The unit configurations differ somewhat throughout the complex. This united worked well for my family because it had a separate large bedroom and private bath downstairs, with 2 other bedrooms (each with private bath) upstairs. The location of this condo was very good -- a short walk to the excellent pool and jacuzzi. And the complex is a short walk to the beach and to a shopping complex that has several excellent restaurants. This condo was immaculately clean when we arrive and really well equipped. We cooked several meals at home and found all the pans, utensils, dishes, etc. that we needed. I highly recommend this management company, this complex and this unit in particular. The condo was generously furnished with everything needed for guests. Instructions were clearly stated. Cleaning service was fast and efficient. The pool and gym made the experience complete. The progressive ongoing rental communications were outstanding. Our experience in L6 at NaHaleO was wonderful. This condo is beautiful, clean, well kept, comfortable and equipped with everything you would need for a great vacation. Fantastic stay, very comfortable, and absolutely enjoyable. Condo, furnishings, and amenities were first class. The appliances and property are well maintained and very comfortable. Open screened ventilation was more than adequate to keep the rooms comforatble without using the airconditioner and barbeque was very handy versus going to the pool to use the community grill. Great location and easy walking to Keauhou shopping center or downtown Kailua-Kona. Gated facility provided an additional level of comfort and property manager checked several times to make sure everything was okay. Neighbors in L-5 are nice and we enjoyed visiting with them, but she criticized several of the younger people at the pool for being to noisey (not that bad). She tends to view the Na Hale O Keauhou as a retirement community versus vacation destination. This is the third year in a row that we have stayed at Na Hale O Keauhou, and L-6 has been the best townhouse so far!We like the 3 bedroom, 3 bath model with one of the bedrooms downstairs as that provides privacy, especially if there are two families. We enjoyed the beach equipment, especially the chairs, towels and boogie boards! The kitchen is well-equipped and the barbecue grill is a plus. After traveling to the Big Island for several years, Na Hale O Keauhou has been a great find because of its location,its amenities and all of the comforts of home! Kris and her property manager were very accomodating and great to work with, and we will be back at L-6 next year! We stayed in Keauhou in mid-May, 2011. After considerable research online, we booked Na Hale O Keauhou for its new-ness and overall appeal. And we were not disappointed !! From the moment we stepped into L-6 we felt at home, and at ease. The estate, and the condo, are immaculately maintained. Small details throughout the townhome served as reminders to the owners' efforts in making their guests feel welcomed, relaxed and pampered. We spent numerous hours on the lanai, enjoying BBQ meals over the serene views while the gentle sea breeze took away the stresses of our urban life. The pool was exceptional, especially in the way it's perched atop the estate overlooking the island. Our day of departure was indeed a sad one. Our big thanks to the owners of L6 and the staff of Na Hale O Keauhou in making our Kona vacation such a successful and memorable one. We will definitely be back here (L6) sometime again. Mahalo nui loa and aloha ! 5 stars. What a delight! We stayed 1 week in unit L6 at Na Hale O Keauhou - 1 old couple plus an unrelated young couple, with a 5 year old boy. Privacy in the unit was great. The unit is spacious, comfortable, well appointed, and beautiful. The service was superb: Brand new fridge quit cooling; Alan had it fixed in less than 24 hours. We ran out of propane; Alan brought a replacement promptly. We loved the walkability - groceries, mall, state park, bus stop. There was no noise from alii Drive. We used and appreciated the beach equipment, all in working order. We enjoyed daily dips in the large, well-maintained pool and hot tub. The evening view, the quiet, and the landscaping all insured a wonderful stay. We recommend L6 with no reservations. My Family stayed in Condo L6 from March 30 to april 7th. The condo is absolutly georgous with a great view ! It has everything you need for a great vacation in Hawaii , right down to the boogy boards, and beach towels for the beach. Located just far enough away from the all the hussle and bustle of the boardwalk , and yet close enough to a great little shopping center with all the amenities, and great restaurants you would need . The pool area in the complex is very clean , and well maintained .the owner (Kris was very helpfull, and went above , and beyond when it came to suggesting great places to go , and things to do.We ended up requireing a late check out because our flight didn't leave until 9:30 in the evening , and after chatting with Kris , this was not a problem at all. We will deffinatly be booking the L6 unit again for our next vacation . Thanks agin Kriss for letting our family share your beautiful home . We booked our stay in L6 and had contact with Kris (owner) several times before we left. She was extremely helpful in giving tips and information about the area. The property is less than 5 minutes walking to a major shopping center, including restaurants, drug store, urgent care, and the us Post Office. We were a ten minute walk to the beach. The location was really great! We watched many beautiful Kona sunsets and enjoyed many breakfasts from the lanai. The grass area outside was perfect for our daughter to run and play, while we sat on the lanai. We have already recommended this condo to family that lives on the island. They came to have dinner with us and were so impressed by how clean, comfortable and how much it felt like home. This condo really lends to entertaining. I cannot say enough good things about Kris and the condo. We will be back!